I’m a guy who likes to wake up early. Though, I’m not a guy who is pretty active in the morning hours. Yesterday, I had to get up two hours earlier than I usually get up: 4 AM. I crawled over some boxes and crates I packed the past few days, because I’ll move soon. Due to the lack of light I almost fell on my phone, but I could recover, fetch up my phone and turn the alarm off. Soon after my morning routine, I fetched a taxi near Alexanderplatz, Berlin, taking me to the Airport. The taxi driver asked me what my profession was and I told him, that I am a self-employed software developer. He asked me what I was up to and I told him that I was going to take a flight to Zurich, discussing the new Swiss Universe app from Swiss International Air Lines. We arrived at the airport and I was heading to the check-in counter to get my ticket. You need to know: I’m quite unfamiliar with taking a flight, so the usual bureaucracy is very impressive to me, so you may skip these “boring” things and read on a few paragraphs later. Heading on to the security checks. Last time I did this was when I was flying from London to cologne last year. You never know how much stuff you have in your backpack until you have to unpack it. Nothing unusual was found, so I headed on to the plane. SWISS greeted me with an business class ticket, which I took gratefully. The flight took off and I had the time of my life in the air. I really, really enjoyed it! After landing, I got me some Swiss francs and thought it would be enough to get to the DOCMINE office and back to the airport, which in fact was not the case. Compared to the drive in Berlin, it was three times as expensive. When I arrived at Tom Talent, I was thinking of how I got there. I am still not sure of how Robin, the Head of Creation at DOCMINE got to know me when he once wrote me an email. Probably, because I was developing a WordPress plugin at that time, allowing WordPress posts to be exported into XML files, which then in fact could be reimported in InDesign. I was greeted by the whole Swiss DOCMINE team and soon enough the guys from SWISS arrived. After a quick introduction to each other, we sat down and started our non-Workshop. I already knew that the app stated above was a launch title for the Adobe DPS 2015 event at the end of July in New York and that there are only very few apps being thus advanced. Therefore, we had a good starting point to discuss the further tasks and workflows, which I obviously can’t tell you as of now. What I can tell you for sure is, that there will be a responsive layout for all devices currently available some time in the future. 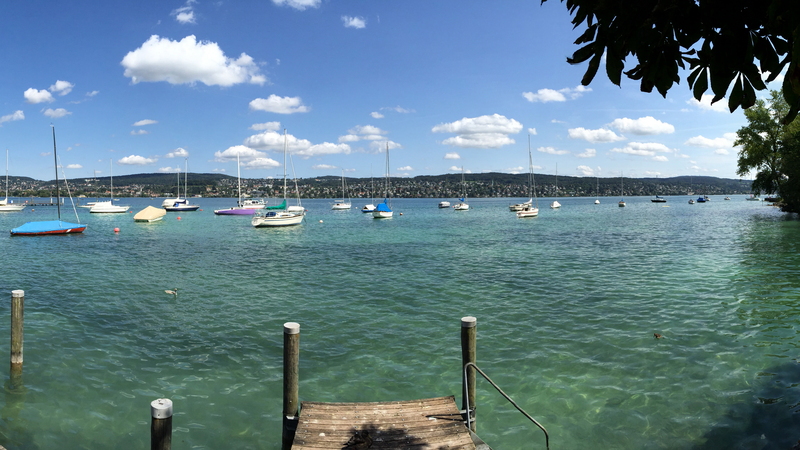 During a break for lunch I took the photo above and enjoyed the warm and welcoming weather in Zurich. The in-house “canteen” (it felt more like a restaurant with very good service) served pizza and salad and an excellent white wine (you should know, that I’m not the guy drinking wine, but that one was very good!). We were chatting about other topics than the app and I was smiling all the time, because the guys from DOCMINE and SWISS were talking all the time in Swiss-German, which Germans like me may find very funny. At first, it was hard to understand them, but after a while I got the accent right and from that point onwards, it was very clear to me, what was going on. I was still answering in German. After the non-Workshop ended, I was heading back to the Zurich airport. And unfortunately, I got under time pressure, because it seemed that anyone who had a car in Zurich was driving at that time. The taxi driver I fetched this time was another very cool one. We talked a lot about Berlin and how he played Contrabass the other day in a club there. I asked him if I could pay with my ATM card, because his colleague took so much money from me and he answered, that it was no problem at all and that he will have to talk to his colleague, doing a knuckle sandwich move. Then we started laughing. We arrived about two minutes before the gate closed, so I hurried to the check-in counter and moved on to the security check. I was unpacking my bag already before I had a basket to put my belongings into. I forgot almost half of the stuff in my bag, for example the power brick of my laptop and other technical devices, but they didn’t ask me to further unpack it, so I went on. The flight took off with me, fortunately. In fact, I was ten minutes early, because the flight had been delayed. None the less, I was breathing heavily, because I sprinted like never before. Entering the plane and sitting down marked the point when I summed up the day. It was a very productive one. We took off soon after I sat down and I was able to get a glimpse out of the window. After a little bit more than one hour we landed in Berlin. My ears didn’t like the landing. It felt like water was sloshing in it. You know, it’s like when you took a shower and want to try to get the water out of your ear, you are jumping up and down, holding the head bent, so the ear with the water in it points towards the floor? I headed to another taxi driver this time, taking me back to the Alexanderplatz, where my day started. Our conversation started when I told him, that my ears didn’t like the landing. We had an very interesting talk about doctors, the refugees coming to Europe, parents and how they are (or should be) important to everyone and in fact what I was doing that day. When I left, he said he would remember my face, because I was such a cool guy to talk to. Or because I gave him such a good tip, I’ll never know. I came home and stumbled upon the crates and boxes, I was avoiding that morning… You can’t be lucky all the time. So, have you been to Zurich? How do you like it? What about flying? When and whereto did your last flight go? What about taxi drivers? Did you ever had a cool conversation with them?